We had a wonderful time at Golden Earthworm Organic Farm during their Harvest Festival recently, an annual event they host for their 2,000 CSA (community supported agriculture) members. One of the main points of becoming a member of a CSA – in addition to supporting a local farm and getting fresh, seasonal produce – is having a personal connection with the farmers who grow your food. Events such as this one offer a chance to walk in the fields and see exactly where your vegetables are grown. And, a chance to chat with the farmers – to ask them questions, give them feedback and just have a few laughs. We had been invited by Matthew Kurek and Maggie Wood, who run the farm along with James Russo, to come give a cooking demo of some of our recipes. After receiving a long list from the farm of which vegetables would be available, we decided to make two dishes: Kohlrabi en roux (kohlrabi in white sauce) and Krautsalat (or cabbage slaw). We arrived at the farm on a warm, windy Sunday afternoon and found a big, green pile of freshly harvested vegetables waiting for us. And a bunch of CSA members who were ready to chat, watch us cook and eat! 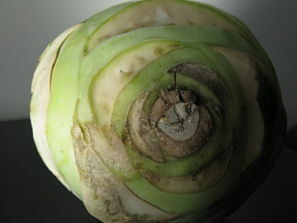 We got busy prepping the kohlrabi – removing the stalks and leaves, then peeling and slicing the bulbs. After chopping some parsley to add to the dish, we cooked the kohlrabi until tender, then made a roux, a white sauce made with butter and flour and vegetable broth. Kohlrabi often appears in stores, at markets and in CSA boxes without its stalks and leaves, but these had their leaves intact so we decided to use them in the dish. After tossing the cooked kohlrabi with the chopped parsley, we combined them with the roux, and served it up on little fluted paper plates. The day was so busy and fun – and went by so quickly – we unfortunately didn’t get any photos of the plated food (The photo below of the finished dish is actually from a few weeks ago, when I made it at home). Luckily, we ran into photographer Jaime Jimenez, a fellow member of my CSA in Queens, Farm Spot, who was visiting the farm with his family and who offered to shoot some photos for us. Thanks, Jaime! 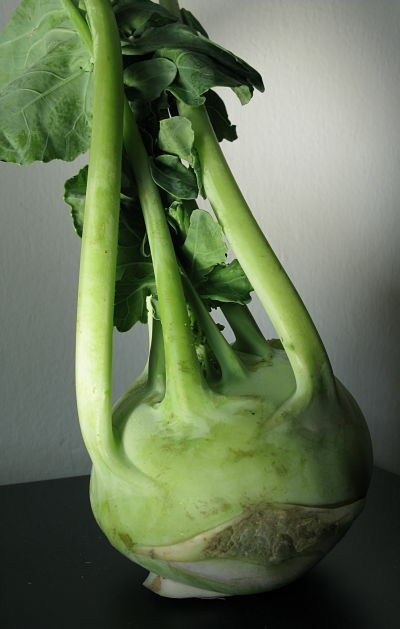 Kohlrabi seems to be a vegetable that people regularly refer to as being one of the most difficult to cook with – or rather, the one people are most confused about because they are unfamiliar with it. So we were especially delighted to see that everyone loved this recipe. Everyone – from little children to grandmothers – polished off their sample. Most asked for seconds, some asked for thirds. It’s that good. 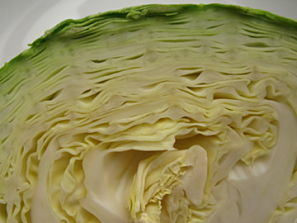 Kohlrabi is in the cabbage family and has a subtle, somewhat sweet flavor, similar to Brussels sprouts. Ideally, the kohlrabi will be tender. It is best to use medium-sized bulbs, rather than very large or very small ones. The outside skin must be peeled, either before or after cooking. Here we use the bulbs and the green leaves and discard the stems (though they may be reserved for another use, such as making a stock). This recipe is cooked in the German style with a light roux, or white sauce. We use a light vegetable broth for the liquid, rather than milk or cream, in order to allow the lovely, delicate taste of the kohlrabi to shine through. 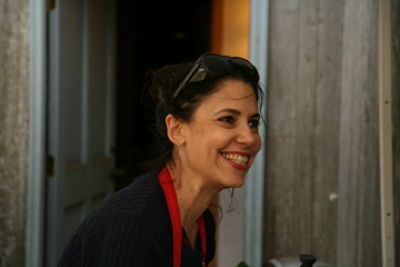 1) Making the Broth: If using bouillon paste, boil the 2 cups water in a medium-sized saucepan. Remove from heat and add the bouillon, stirring to dissolve. If using vegetable broth, skip to step #2. 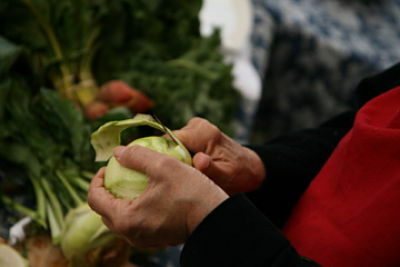 2) Preparing the kohlrabi: Wash the kohlrabi. Trim off the stems from the tops of the bulbs and cut off the green leaves. Discard the stems (or save them for a future soup stock), and chop the leaves into ¼” slices. Set aside. Peel the kohlrabi bulbs, removing all the hard outer part. Slice the bulbs into ¼” slices. 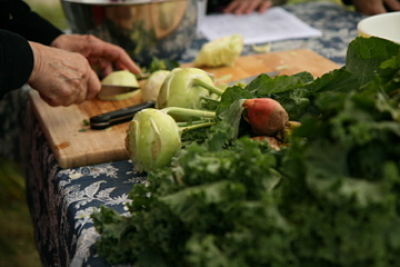 3) Cooking the kohlrabi: Bring the broth to a boil. 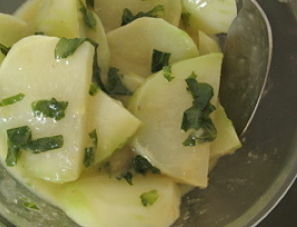 Add the sliced kohlrabi bulbs and leaves, lower heat, cover and simmer about 15 minutes, or until tender when pierced with a fork. Remove from heat and drain, reserving the liquid. 4) Making the white sauce: In a second pan, melt the butter over medium heat. Lower heat and add the flour, whisking to blend. When the mixture is smooth, slowly add the broth, stirring all the while to keep the sauce smooth. Keep adding liquid until you have reached the desired consistency. Add salt and white pepper to taste, and the parsley and mix. Finally, add the drained vegetables. Serve immediately (or keep warm on a very low flame until ready to serve). Really enjoying your blog and awaiting your next post! I am still in my thirties but my father was born in Frankfurt before the Shoah and your recipes enable me to create his favourite childhood dishes. I also studied German and have a 1914 Jewish Hosuewive’s recipe book that I use sometimes.